Swami has on countless occasions repeated this famous verse from Shankaracharya’s Bhaja Govindam. The Lord in all His mercy has cautioned us so many times that the ‘rules of grammar’ – or secular, worldly knowledge that we clutter our brains with from dawn to dusk will not take us across the ocean of Samsara. It is only pure, selfless Love for God that is the ultimate key to open the door to the Kingdom of Sai. This worldly knowledge can at best help us to earn a living and fill our belly! It is of course required to some limited extent. However, what is most essential to lead a sacred and blissful life is Pure Devotion to our Master. Only recently, in one of His Discourses Swami was acting as a proud Mother! The Lord was explaining how some of His students, who have acquired even double degrees and were working in very reputable big companies for large salaries, gave it all up and pleaded with Swami to let them stay close to Him and serve at His Divine Lotus Feet. Mother Sai was so proud of Her children who were disinterested in the lures of the material world, but were contented to serve the Mother at home! No work was too low for them. Unfortunately, schools today concentrate on filling young minds with mere book knowledge. They fail to inculcate Human Values, discipline and devotion in the students or guide them towards the goal of life. But what is the Goal of Life? It is to be liberated from this feeling that we are separate from God. We should have the conviction that ‘God and I are one and the same’ that ‘this world is but an illusion and only God exists’. To develop this feeling or state of the mind, we need to intensify our Love for God. The ‘rules of grammar’ or worldly knowledge cannot help us reach this goal. Follow the Master: the Master is Dharma. We must lead a righteous life, a life filled with Human Values. Face the Devil: We need to avoid falling prey to the temptations that come our way when we try and earn money. Fight to the End: We must fight off Kama or desires. For desires and attachments ultimately bring grief! Finish the Game: We must attain the feeling of Oneness with the Lord and Liberation from ignorance. Therefore, if we want to achieve success in this endeavour we must control the body, mind and senses! As Swami says, "Bend the Body, Mend the Senses and End the Mind". The ultimate aim is to attain that state where the Mind has been totally stilled, free from thoughts, and to experience the Oneness with God in the depth of that Supreme Silence! The Mind has been compared to a lake. The water on the surface needs to be completely still and free from dust and dirt for a clear reflection of the Sun above. Similarly, the Mind has to be cleansed of all pollution and stilled to get a glimpse of the Indweller or Atma within. Unfortunately, the lake of the Mind is subject to dust and dirt being thrown into it on a daily basis through the misuse of our senses. Through the agitations of the body, the water is constantly trembling on the surface. We see all around us how people fail to control their body for even a few minutes – these agitations ultimately affect the Mind. Through the senses, we pollute the Mind. For example, the eye acts like a camera and takes a photograph of all that it sees. This ‘photographic film’ is imprinted on the Mind, which becomes polluted from the bad scenes we see. The ears send bad vibrations of the gossip we hear. The tongue tastes foods which excite the Mind! Therefore, it is most essential that we practise first and then teach our children that control of the senses is the key to controlling the mind. Control of the Mind will lead to equilibrium in the midst of activity! We should practise taking only good food for the eyes – not watching irrelevant television, cinema, newspapers and magazines – Swami has said most clearly that TV should only be for educational or spiritual programmes. Swami has told us that it is harmful to read baseless fictional novels. Why teach kids ‘Baa Baa Black Sheep’ and lead them to become like black sheep? Instead expound the great truths of the sacred Scriptures and model their lives on sublime values. Dare to give up watching the favourite TV soaps, films, newspapers and magazines for Swami! The ears are subjected to so much pollution from all the gossip that we listen to. Swami says that the ears have been given to listen to the Divine Name of God. Dare to turn away from someone who is spreading gossip. Dare to give up listening to so called ‘Pop’ music including Bollywood songs – are there not enough spiritual songs and tunes to listen to? Among the senses, the sense of speech deserves special mention. This is because it involves the tongue – which Swami says plays a central role in the control of the senses. The tongue has a dual function for both taste and speech and is liable to make mistakes on two accounts! The one who can control the tongue can verily control all the other senses. Swami has said that we talk far too much. We should talk softly, sweetly and only when there is pressing need. When we talk too much we lose our memory power, according to our Divine Master. Speech should be Truthful and in a pleasing manner. The ancient saints and sages practised silence for long periods – for it is said, ‘in the depths of silence can be heard the Voice of God!’ Dare to practise silence and not indulge in back-biting just because others are doing so. We should only taste and consume Sathwik food which has been sanctified by the Name of the Lord. This helps keep us calm, peaceful and healthy. Dare to give up the tasty dishes that only serve to inflame or dull the Mind and fills us with passion and lust. ‘Dare to be different!’ This phrase was used by one of our Uncles from Malaysia and became imprinted on my mind from one of his talks a few years back. We should ‘dare to be different’ in our approach to educate the children and Youth. We should not encourage them to pollute their Minds from the misuse of the senses. We should be prime examples of sacrifice by giving up this false lifestyle and ideology that materialism has fathered. We should encourage them that God should be the central Focus of their Life – that they should enshrine the Lord within their heart and protect this shrine from all pollution by keeping a constant check on the senses, which are the doorways into this Temple of the Body. There are many examples of enlightened beings who had immense faith and devotion in the Master. They were not exemplary in worldly knowledge, yet all knowledge came to them through Divine Grace. 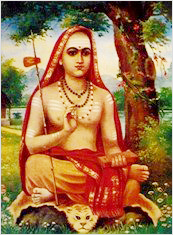 One such person was Padmapaad who was a disciple of Sankaracharya. Unlike the other disciples of the Master, he was not interested in learning bookish knowledge. He was more concerned with devotional service to the Master. He used to take the Master’s clothes daily to the river to be washed. Because he did not pay much attention to his studies he was lagging behind and ridiculed by the other disciples for wasting his time in serving the Master. One day whilst he was out washing the clothes, the river rose suddenly in a storm and he could not get back to the dry land. He simply prayed to his Master and, to the surprise of the other disciples watching from the dry land, a stone lotus flower appeared wherever he put his foot. Then another appeared and so on, until he was able to walk back to the river bank supported by these stones. At once the other disciples recognised their mistake and shouted ‘Glory to Padmapaad, Glory to our Master!’ The Master rewarded him for his exceptional devotion, blessing him with great joy and all knowledge was instantly given unto him. This story highlights how devotion to God is of utmost importance and should be the focus of all endeavours. Swami says education is for earning a living whereas Educare is for Life. What is Educare? It involves bringing out the Human Values which are latent within us. Schools need to bring out these Human Values which are but a natural process of our spiritual evolution. Just recently Swami explained the meaning of the Navarathri Festival. The Lord said that we should first give up our animal tendencies. Then we should manifest our Human Values which are latent within. Then finally we should manifest Divine qualities and become one with the Lord in thought, word and deed. Swami has emphasised that what is important is not the ‘marks’ that you get, but the ‘remarks’ that you get. Better to have Love for God and an exemplary character than to be a scholar. Better to be ‘good’ than ‘great’. Education can at best bring you to the doorstep, however it will not take you into the vast mansion of the Lord. Swami says ‘Education is the beginning of Character’ – it is not the Goal. What education did Sabari have? Yet she was able to draw the Lord of the Universe, Sri Ram, to her little hut through her faultless devotion. Let us intensify our love for God and practise control of the body, mind and senses to ultimately realise our Oneness with God. Let us be perfect examples for our children and the youth to follow. Let us 'Dare to be Different' from the crowd by following our Swami with Duty, Discipline, Devotion, Determination, Discrimination and Dedication. Let us not fall prey or allow our children to fall prey to the immoral behaviour that has been spawned by television, cinema, radio, internet and mobile phone culture. Give up now, from today, as an offering to Swami for this glorious 80th year of His Advent, this artificial life and develop a Life full of Love and Sacrifice!